Issues & Errors with Restore from ios7 Backup to ios9 on iPhone 5? The screenshot of error message below is from this thread from Apple forums. So I split & posted this Error Message separately to solve this issue. Some of the apps in your iTunes library were not installed on the iPhone “AS_iPhone5_711” because one or more errors occurred. For a list of apps that could not be installed, click the + below. For one app, when I upgraded the version via iTunes and it synced/ installed finally, but the rest did not work despite updates. PS: I thought maybe it was AppSync causing it so I got rid of it last 2 'tries'. I don't mind taking manual steps to resolve this as long as there is some way. Found some posts that talk about this error, but they are old and not sure if connected. 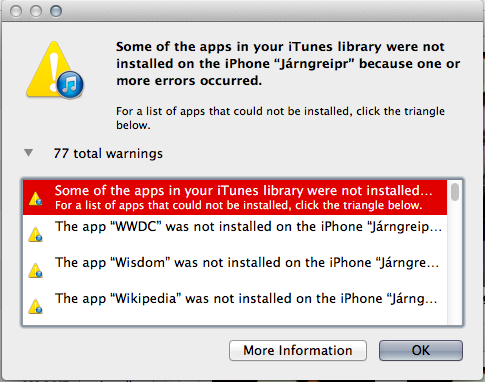 Try installing those bugged apps direct from the App Store, as opposed to relying on the backup package. Use the backup to get your own content (photos, messages, etc), and ignore the apps. Download them fresh from the app store. This has been a pain since the move to iOS 9. There is not ultimate fix for this, but these are things I've found that helped in various combinations and order. I will update this answer with additional workarounds whenever I come across them. At times, while I was still connected to iTunes I'd go to AppStore and download the "Waiting" App from there, and other times that would not work. Certain times, the number of Waiting Apps/ Warnings would just slowly decrease each time I make iTunes sync with the phone. A recent example was from 200 > 193 > 175 and so on.. There are some grave issues with Apple's iTunes Sync with iPhones and made even more grave with recent App Slicing and iCloud integration, we'll have to reply on Trial and Error some of the above on this. And for a 64GB iPhone, given that neither the USB 2 speed connection or the WiFi speeds are good enough or fast enough to Backup and Restore the data (It took my iPhone 64 GB 12+ Hours to do a Restore from Backup and was still faulty), so when iPhone's can sync at USB 3 SuperSpeeds, we might have a better experience. Not the answer you're looking for? Browse other questions tagged iphone itunes applications data-synchronization error .